SoftPlanet makes it possible for everyone to get free Enable Admin download directly from our servers. There is no registration needed for downloading. Enable Admin 1.5 is a program that you have to run in CMD mode. It is designed to enable or disable the built-in Administrative account. This is very handy, because in Windows Vista, 7 and 8 this account is disabled by default. By having it quickly enabled you will not have to deal with the annoying User Account Control (UAC) which pops up, for example, every time when you install an application. 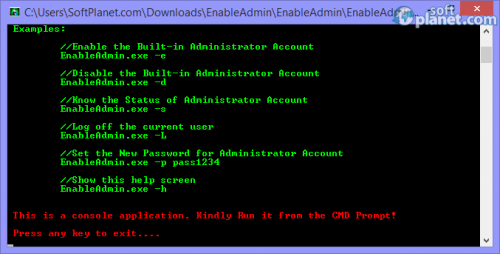 Enable Admin has five keys that can be entered after you type EnableAdmin.exe in your Command line window. -E will enable while -D will disable the account; -S will tell you the status of the account while -L will log off the current user. -P will set a new Administrator password for you. Enable Admin is a lightweight application that can come handy if you do not want to be disturbed so much by the UAC of your PC. Our security scan shows that Enable Admin is clean from viruses. The current version of Enable Admin has been scanned by our system, which contains 46 different anti-virus algorithms. That ensures that Enable Admin 1.5 is 100% safe for your computer.